Cryosat L2 data includes a SIRAL Mode indicator (field 2) for each 20Hz record. 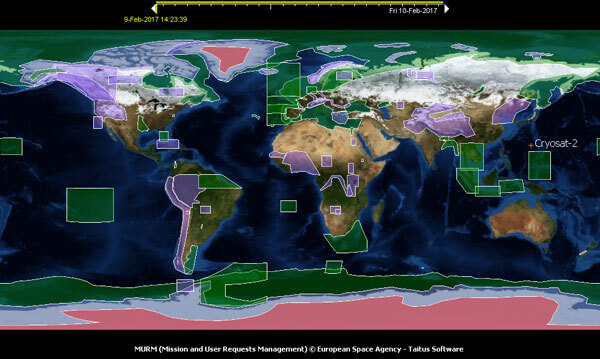 For each measurement, Cryosat may be operating in LRM, SAR, SARIN or SARIN Degraded mode depending upon the instrument health and current operational geographical mode mask (see latest example v3.9 ). The operational geographical mode mask is updated weekly (every Monday at 00:00 UCT), primarily to account for changes in sea-ice extent, and we therefore expect to mainly observe changes in the SAR/LRM mode extent between data takes in areas of sea-ice. Note that for 30 day data takes, the mode mask will normally change during the data take period and therefore some areas will have a mixed mode. This tool provides statistics and global and polar map plots of the SIRAL mode for each 7-day and 30-day data take. 7-day data takes are aligned to the mode mask change dates.